I made two different theme bentos this morning. They were inspired by the current events happening in October and they are the PINK Breast Cancer Awareness events and the OctoberFest. 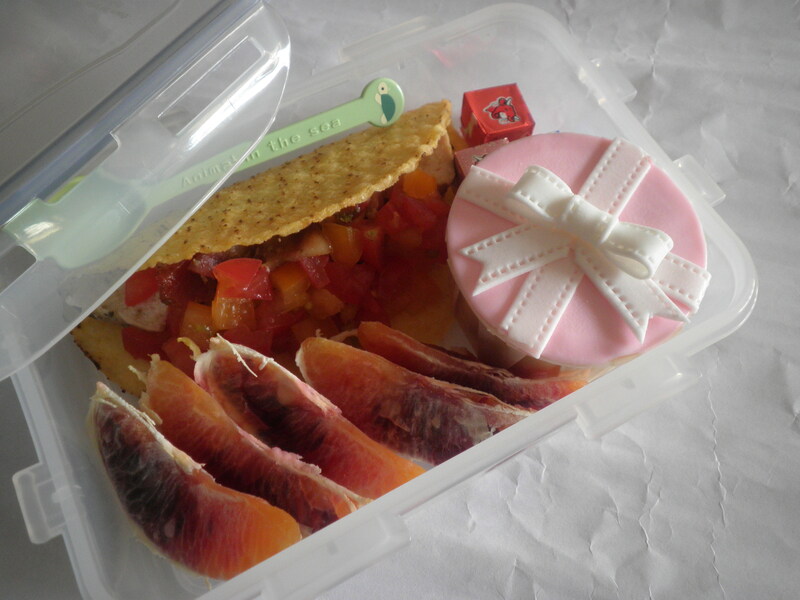 I know that there were the PINK bentos happening much earlier in the bento community but I didn’t have the luxury of time to make one. I can’t even recall if I made any nice comments on those pretty bentos. Old age is catching up with me and made worse by lack of sleep. Anyway, here are the bentos for today! Both bentos have almost the same contents. I made luncheon ham and cheese pumpernickel bagel. My first time trying out pumpernickel bagel and this was influenced by Barney, the purple dinosaur who had a song all about the different kind of breads. Its nice though I still don’t know what it meant by pumpernickel. Haha! The rest of the bagel comprises of cherry tomatoes, slices of plum, Hershey’s chocolates, some watermelon slices and baked pretzels for hubs. Now come to the part about the decos. 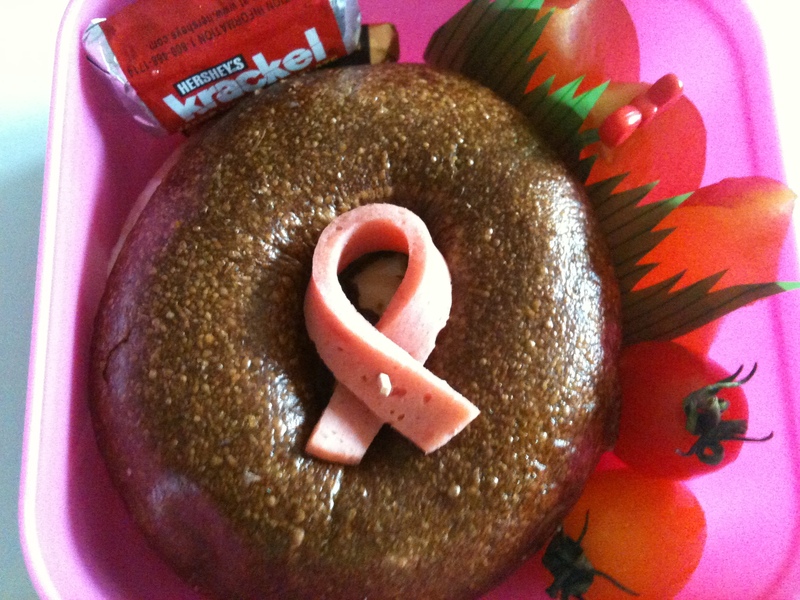 My pink ribbon was made from the luncheon ham. I simply twist it and held it together with a dry soba noodle. Nothing too difficult but hope it shows my support for the effort put into creating the awareness about this deadly disease. 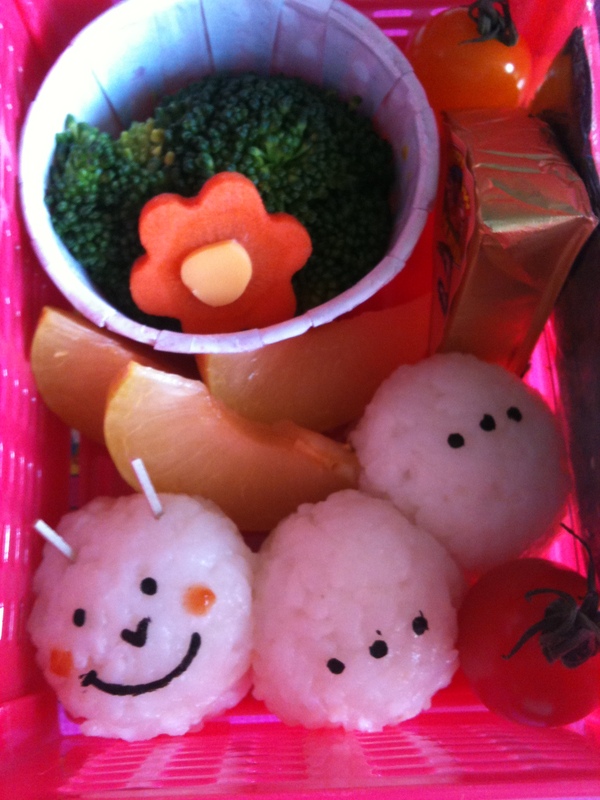 My hubs one is a more jovial bento. I made him a mug of stout from cheese and nori. Thanks to my bento friends especially Mils and Maki, I tried my hands on cutting cheese with a needle!! Yes, needle as suggested by Mils! I used the needle to cut out the froth and mug and I think its much easier than toothpick. I just need to hold it upright coz slanting the needle will break the cheese a bit. Now I have more confidence in making more designs! I finally made my first in-flight bento!! 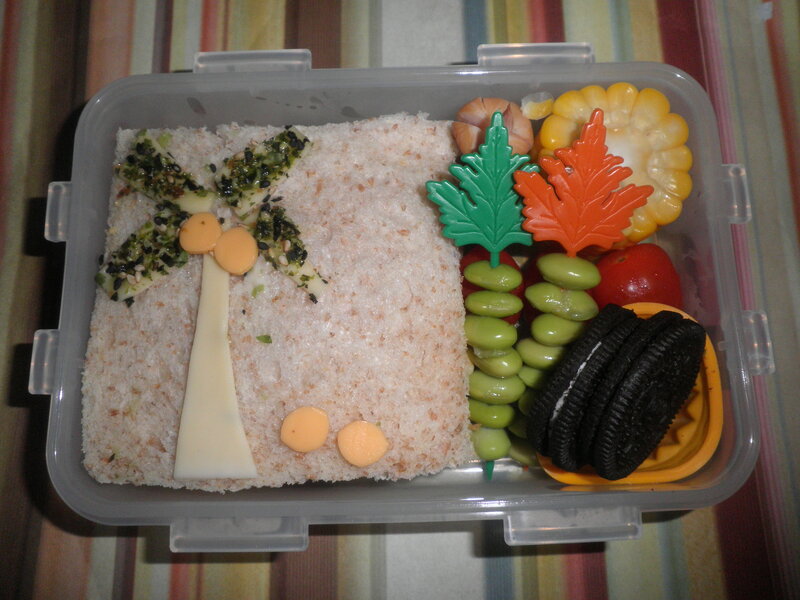 This idea was inspired by Hapabento who had been making really scrumptious in-flight bento meals for her parting guests. I made mine for my SIL who was to board a 24 hours flight back to New York. She had requested for one before she came home to visit and I’ve also wanted to do one for her to thank her for the support she gave in my bento making hobby. She bought me the Yum Yum Bento Box – Fresh Recipes for Adorable Lunches by Crystal “Pikko” Watanabe and Maki Ogawa and because I bought the same book she kindly allowed me to give it away in my first bento contest. 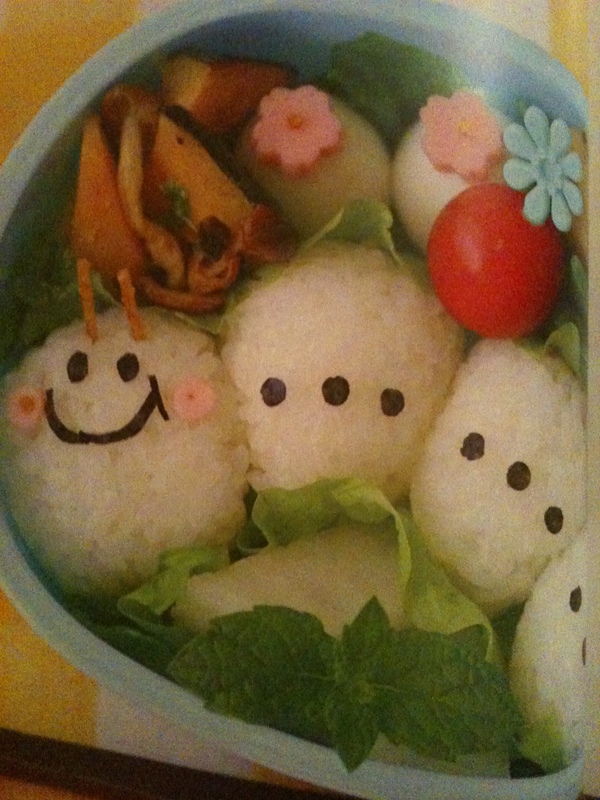 Obviously I pick a bento from the book to make for her and I choose to make her the cute caterpillar as featured below. I picked this bento because my SIL wanted to try onigiri and this also seems quite easy to make. So I followed the instructions in the book to make the onigiri and filled mine with tiny mayo burger patty. Its really easy with the use of cling film and am kinda proud with the result except my caterpillar is a little bit short. Haha! Over the weekend my SIL bought these adorable cupcakes from this really sweet looking store, “Delectable” . She bought them to bring along with her when she visit her friend but I managed to convince her to buy for my little girl so as to “bribe” her to like my SIL. Haha!! And now the mummy and papa also get to eat. 😀 So my bentos this morning did not require any effort on my part to make it kawaii, thanks to the cupcakes! Haha! 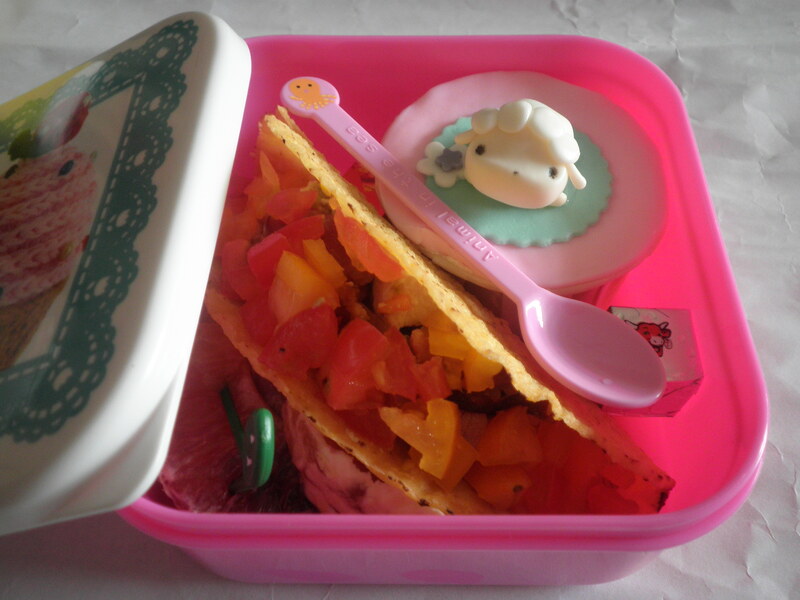 And these bentos are my first attempt at using taco shells. I’ve never made tacos before but I’ve been supermarket shopping to stock up and saw these and thought I’ll give them a try. Instead of the usual minced meat with salsa, I made grilled pesto chicken breast. I marinated the chicken breast overnight with pesto sauce from Marks & Spencer and grilled it this morning. I covered the breast with two strips of back bacon so as the meat will not be too dry and the meat indeed stayed really juicy and the bacon were crispy! Yum Yum. I then cubed some tomatoes and added on top of the meat. I didn’t have any cheese that could be grated so I put in three little tiny Laughing Cow cheese cubes to be eaten together with the taco. Here are the bentos! 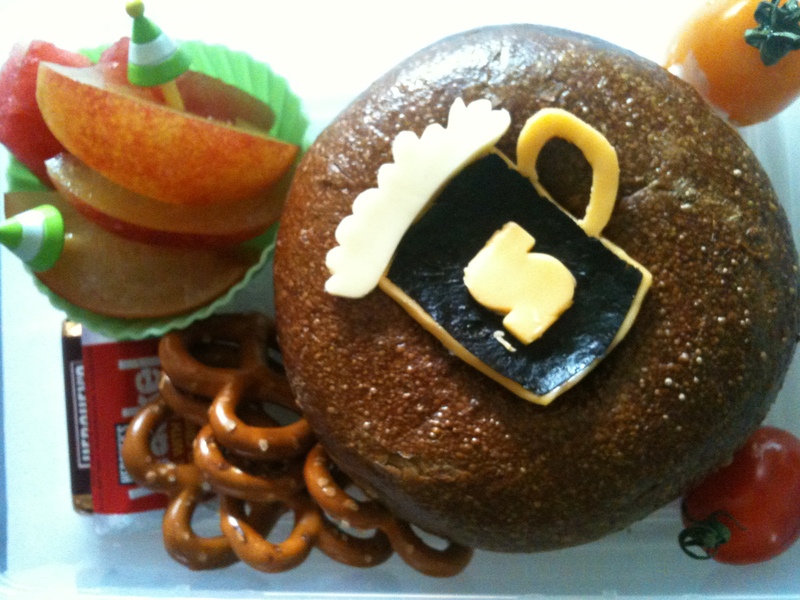 In this bento, I made a sausage and mozzarella cheese omelette sandwich and decorated it with the tree. The tree is made from free-hand cut out cheese and the leaves are actually made from wasabi furikake. I also cut another darker coloured cheese as the coconuts, some still hanging on the trees and two on the ground. 😀 Also made some tulip sausages (hidden though behind the leaves picks), edamame cocktails, corn, cherry tomatoes and for treats, two pieces of Oreos! While doing this bento, it got me thinking, will cheese be easier to cut if its chilled or if its already a bit soft at room temperature? I cut mine with a knife this time and not toothpick because I don’t have toothpicks at home and I don’t have any idea about the condition of the cheese that will be great for cutting without it breaking. Hope someone who reads my blog can educate me. 😀 Thanking you in advance for that.